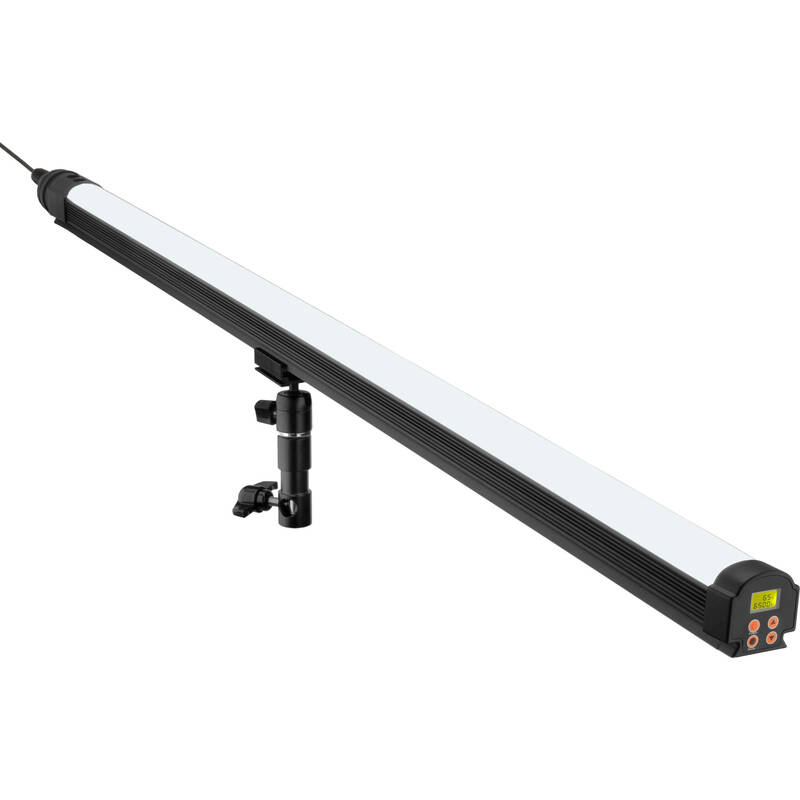 The 53" SpectroLED Baton Stick Light from Genaray has a unique design and advanced technology that not only makes creative expression easy - it makes it fun! The Baton's 110-degree beam spread and long, slim shape provide for dramatic, selective illumination. Color temperature is variable from 2800 to 6500K in 100K increments but for working quickly, you can also use the Preset Buttons to jump to 2800, 3200, 4300, 5600, or 6500K. Anyway you use it though, you'll benefit from the Baton's CRI rating of 95 to 98 and TLCI rating of 95 - indicators of high accuracy in color rendering. Light intensity is also variable from 100 to 10% in 1% increments and like color temperature has Preset Buttons that switch you to 25, 50, 75, or 100% power instantly. While you can make color and dimming adjustments locally on the fixture and see them displayed on the unit's LCD screen, you can also make them on one or on several Batons remotely from a console via onboard DMX. The entire length of the Baton is dovetailed, allowing it to be supported and secured at any point in its intelligently designed Arca-Type Ball Head Mount, which offers 360-degree rotation and 180-degree tilting. The mount has a 5/8" receiver for industry-standard light stands but by removing its tightening knob, the mount can be used as a 1-1/8" pin that inserts into a Junior stand's receiver. Alternatively, the Baton comes with two strong magnetic disks that attach firmly to any metal surface. The Baton is ready for worldwide use via its universal 100 to 240 VAC power supply and comes with a carry case for storage and transport. Color temperature is variable from 2800 to 6500K in 100K increments but for working quickly, you can also use the Preset Buttons to jump to 2800, 3200, 4300, 5600, or 6500K. The Baton's CRI rating of 95 to 98 and TLCI rating of 95 are indicators of high accuracy in color rendering. Light intensity is also variable from 100 to 10% in 1% increments and like color temperature has Preset Buttons that switch you to 25, 50, 75, or 100% power instantly. Fueling your creativity with even more placement options, the included, strong magnet mounts allow you to attach the Baton to any metal surface without additional support, so you can light tight spaces where a traditional fixture and a light stand can't go. The entire length of the Baton is dovetailed, allowing it to be supported and secured at any point in its intelligently-designed Arca-Type Ball Head Mount that offers 360-degree rotation and 180-degree tilting. The mount has a 5/8" receiver for industry-standard light stands but by removing its tightening knob the mount can be used as a 1-1/8" pin that inserts into a Junior stand's receiver. Box Dimensions (LxWxH) 60.0 x 7.5 x 7.0"
SpectroLED Baton Stick Light (53") is rated 4.3 out of 5 by 4. Rated 3 out of 5 by Douglas from Great light source I really like the light. It works perfectly. Unfortunately the protective sleeve tube was misshapen and cant provide the important service needed to protect the light when stored. Otherwise 5 stars.